When building a fire be sure the dampener is in the vertical position. To build a fire, place paper and kindling upon surface of grate. 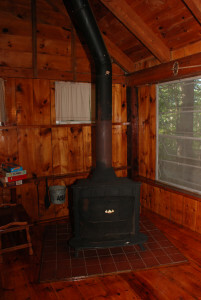 Place larger pieces of wood on the kindling and light. Close the front doors and open the vent at the bottom so that you will get as much draft as possible for starting the fire. After the fire has started, the front door may be closed. You can control the rate of burning by manipulating the bottom dampers or by closing the front doors but never close the front doors when a large fire is burning. Use a fire screen to prevent sparks from entering the room. Do not let ashes build up to the cast iron grate or over firing will cause the grate to burn out. If the cast iron back, sides or front door of your Franklin turn red, you are over-firing this heater. Open the front doors to let it cool down and reduce the amount of fire in the heater before closing the doors.